What many may not know is the fact that an urgent care home visit is a possibility. In fact, it's possible to have the care of a house call doctor simply by phoning House Call Doctor Los Angeles and having a mobile doctor dispatched to your home, office or workplace. Dr. Michael Farzam, our resident primary care provider, is a board-certified internist with a plethora of experience, and can provide any care that an urgent care clinic provides. What's more, Dr. Farzam's ability to do an urgent care home visit means you will no longer being subjected to the possibility of contracting a contagious illness from someone else in the waiting room with you at a healthcare clinic. An urgent care home visit doesn't have to be something you only read about in the history books. 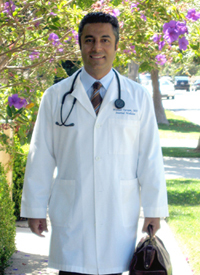 In fact, house call doctors are still around in the 21st century, and Dr. Farzam is one of the top-tier concierge physicians in Southern California, providing urgent care throughout the Greater Los Angeles area and beyond. If you are in need of urgent medical attention but don't want to leave the comfort and privacy of your own home, an urgent care home visit may be just what the doctor ordered. You know you want to see the doctor, but don't want to go to the doctor's office and face a rushed, impersonal professional who leaves you waiting in the packed waiting room. If this scenario sounds familiar, it would behoove you to learn more about doctors on call. Call today at 310-849-7991 anytime, day or night, for quick service!